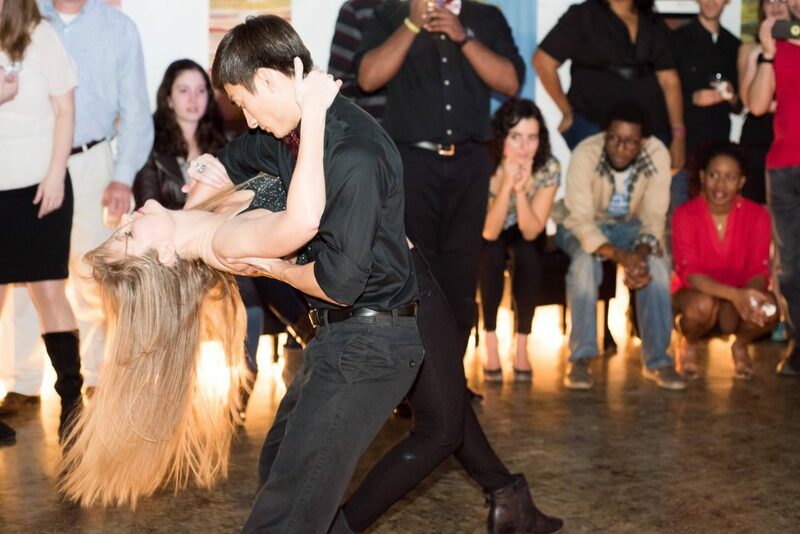 People often gravitate toward social dance because it doesn’t rely on set choreography and has a more spontaneous and improvisational nature. However, that doesn’t mean that principles of choreography can’t be used to mix up your social dancing and make it more interesting and meaningful. I recently took a workshop with Kristin Alexander, the director of Annex Dance Company, a modern dance company in my area. She taught different choreographic techniques for creating sequences and phrases of movement. After the workshop, I started looking for ways to implement these ideas in my social dancing. Try some of these out to mix up your dancing or identify ones that you already use. Although many social dances work within a prescribed timing, playing with the timing creates infinite variations of the same step. For example, in a Bachata, a lead may bring a follow into a sit dip in one count and then take seven counts to get out of it, or do the same movement in just two counts.You also can see this in a step like a rond de jambe—a circle of the leg—that shows up in Salsa, Zouk, Cha-Cha and many other dances. Sometimes the leg whips around in the circle in a count or two and sometimes it’s drawn out over multiple counts for effect. Dancers often choose how they move based on the music. Heavy drumbeats ask for more percussive, sharp movements and gentler strings ask for smoother, more elegant movements. Being intentional about how you move creates a deeper, more interesting dance. Notice if you always do the same movement on different hits of the music or if you have a variety. The same step or move can be executed strong and hard or smooth and soft and it completely changes the look and feel of it. Think about a body roll or body wave. You could do it smooth and continuous all the way through or you could pop your chest out and then move sustained into the rest of the roll. This ties in with fast versus slow but focuses more on the quality of the movement than the speed. Dance does not exist on just one plane. You can dance on multiple dimensions and in multiple directions. Your knees can bend, taking you lower. You can rise up on the balls of your feet, moving you higher. You can arch your back and dip or hinge or you can stretch down into a lunge. Level changes also help express different feelings with the movement and help accent different parts of the music or movement. Taking one movement and executing it using different parts of your body increases your arsenal of moves. Many dancers may do this without even thinking about it. Take a circular roll—you can roll your hips. You can roll your shoulders. You can roll your head. You can roll your wrists. You’re taking the same action and moving it up and down your body. So much can be conveyed with nothing. Sometimes just taking a pause can charge your steps with so much tension and emotion. There may be a break in the music that you choose to wait out or maybe the time just feels right to stop and breathe for a few counts before moving on. Or maybe you hold a shape or step for just a moment to highlight it before moving on. Don’t be afraid of stillness—it’s beautiful and powerful. Are you already using these ideas in your dancing? Did you realize you were doing these things or did they develop naturally? Is there one you want to try to implement? Have fun! Mix it up. Georgia, I’m OLD skool (and just OLD, in general lol)) so it’s ALL about improv and being playful with your partner & the music. I’ll NEVER have the skills of you pro/trained dancers but I just do what I do and have FUN doing it, as long as my partner doesn’t mind that I’m no spinner, dipper, or leg kicker. Girls (& OLD BROADS) just wanna have fun!!!! Thanks for the article and that clip of that couple is GORGEOUS! 🙂 That’s what it’s all about! Social Salsa dancing is all about improvising. Part of its charm is that we can travel to a different city, meet a partner we have never danced with before and successfully improvise a dance with them. To be most successful, the social dancer needs the experience to quickly be a good judge of their new partner, make the best of their skills, know more movements than they execute in any one dance, and has a well detailed understanding of the Salsa lead/follow language. I’m careful about doing choreography. While we can learn from choreographic technique, the disconnect is that most choreography is done to be watched. When we are social dancing, the primary objective is the collaboration and happiness of our partner with the implication that nobody is watching. 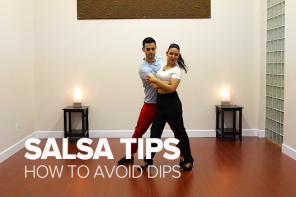 Our Salsa dance elements tend to be limited to functional parts of the social dance unless we are developing a shine because the speed of Salsa dancing leaves less room for the larger leg and arm movements that are typical of choreography. As a result, too much choreography can easily create awkward movements and our social dancing generally uses smaller leg and arm movements. 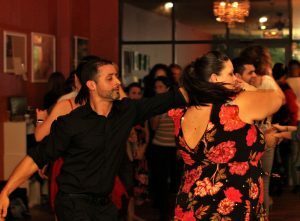 It is true that competition dancing and performances are intended to be watched, so choreography is more appropriate to those forms of Salsa. Is an anti-choreography view productive? I believe so. 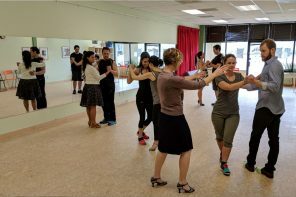 Improving the technique, symmetry, precision, and speed of your dancing allows us to take the improvisation of ordinary social dancing and break those movements down further into their elemental segments and then recombine them in different movement orders to form new movements. For individual practice one of my favorite things to do is to go through all my turns and steps to a precise Salsa timing record. While doing this I work on my timing, positioning, symmetry of movements, speed, technique, and look for any out of position movements. This precision of movement allows me to understand how to interact with my partner and give them a good lead while respecting their position and movement dynamics. The symmetry of movement is important, if I turn and lead across to the left, it may be a regular cross body lead, but if I turn to the right instead, I’m doing a cross body lead behind my back. If your left and right symmetry is good, both moves end up in the same place and you can freely insert either move into your dance without getting out of position. This precise positioning skill is important for doing the faster and more complex moves because there is not enough time to recover from being out of position or off pace. For advanced leads it allows you to adjust to the partners position so a difficult movement ends cleanly, giving them additional confidence. 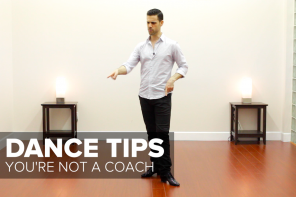 So consider that there are two sides to improving the variety of your dancing and perhaps start short drills on steps and turns a few times a week to improve your technique and precision.